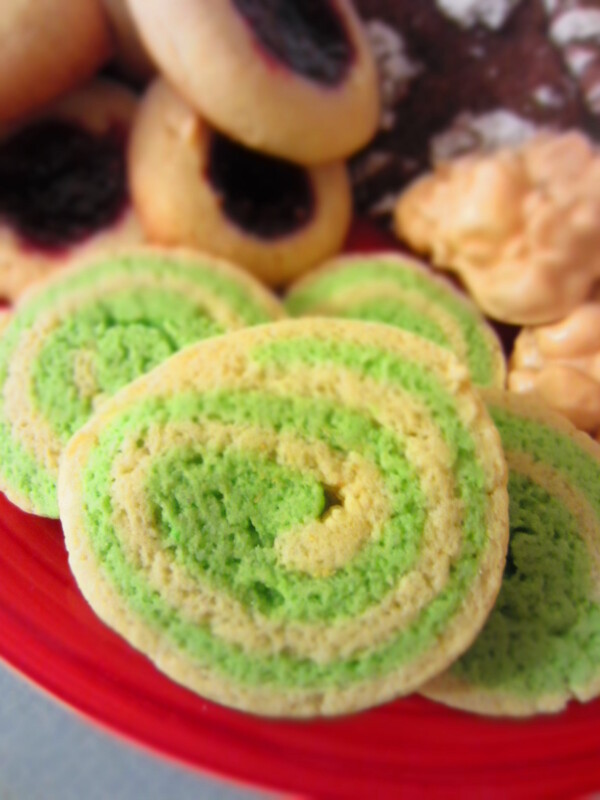 This time I made them I decided to try out the swirl sugar cookie. When the dough was done I simply left half of it in the mixer and added some green food coloring to it. I mixed in the color until it was fairly evenly distributed and then kneaded the dough until the color was smooth. I then rolled out both the white and the green dough into the same sized rectangle. I laid the green on top of the white and rolled it into a tube. Make sure to roll it starting from the long side of the rectangle so you don’t end up with only 5 GIGANTIC cookies…I made that mistake before, it doesn’t work so well! Once you have the log roll it back and forth to smooth out the seam. Then slice it into 1/4 inch (ish) pieces, put them on the pan and bake them as directed. You’ll be able to see the swirl as soon as you start slicing, it’s really fun! If you really need a topping on your sugar cookies you could also put a thin glaze on top of the finished cookies and you’ll be able to still see the swirl. HERE is the sugar cookie recipe I use!